When I was facilitating the Song of the Stars workshop in Hong Kong in May this year, the Spiritual Hierarchy gifted us with a technique for maintaining our inner balance as we move deeper into the Earth’s ascension process, especially the period after the Total Solar Eclipse of Nov 13 and 14. The guides explained the key to a peaceful and joyful ascension for Earth and ourselves is the perfect balancing of all aspects of polarity or duality, so as to minimise manifestations of chaos and extreme instability in our external reality. One technique for achieving this effect is to activate our ascension merkabah regularly. 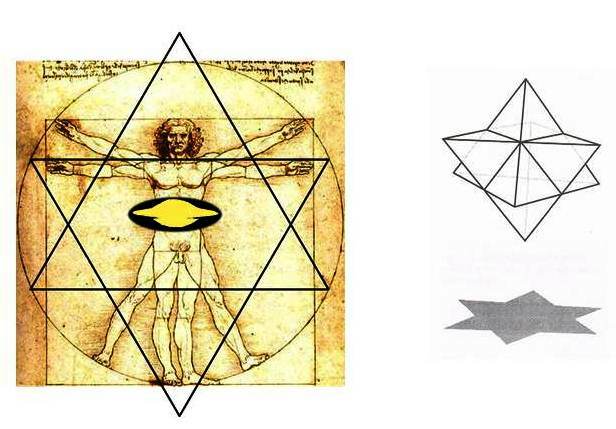 The Merkabah (an Egyptian term) refers to our electro-magnetic field which takes the shape of a star tetrahedron (diagram on top right). A linear version of the merkabah is the star of david (picture on bottom right). By energising our merkabah regularly, not only can we keep ourselves in a high state of spiritual awareness, we also become more resilient to the intrusion of denser vibrations. The guides have also specifically recommended that we practise this meditation daily from 15 Nov 2012 (post-Eclipse) to 21 Dec 2012. I wish for you to experience a perfect balance in your beingness and your body, as we approach the final eclipse season of 2012. Blessings, Ann. thank you Ann I did it right away and felt a shift.